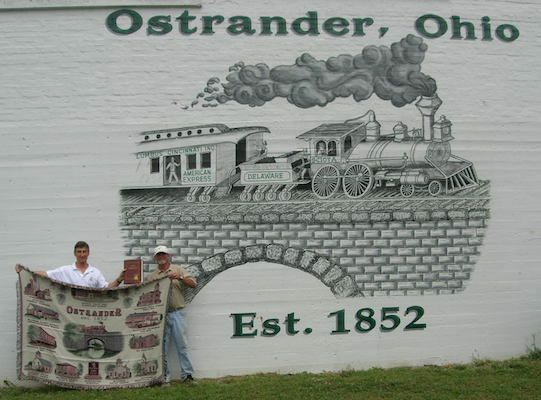 OFA Book Presentation to Ostrander, Ohio – Ostrander Family Association, Inc.
During the OFA Reunion in Tilsonburg, Ontario, Robert F. Ostrander, our new Area Vice President for the Southeastern U.S. region donated an Ostrander Big Book. The Board voted to present a signed copy of the book to the Ostrander, Ohio Library. Kurt Brown, our newly elected President, presented the book to the Mayor of Ostrander, Ohio. I visited your library with Mayor Scott Jones in the middle of a power-out thunderstorm. On August 13th I returned and presented Scott with a 940 page Ostrander Family History book for your library. Hopefully, it has found its way onto your stacks. Inside the front cover is a dedication message from The Ostrander Family Association. Our hope is that it will serve as a resource for the residents of Ostrander, OH to research their community’s namesake family. Your founder, Shelemiah Ostrander, can be found on page 599, and his ancestors and descendents can be traced throughout the book. There is only one Ostrander family in the US and Canada. The “Big Book” is a voyage through history with our family. We also have a quarterly newsletter, “De Bonte Koe”, (which in Dutch means “The Spotted Cow”), which we will send to you. This was the name of the ship on which the first Ostrander family traveled to new Amsterdam (New York City) in 1660. We also have a website, www.ostrander.org which has a lot of interesting material. 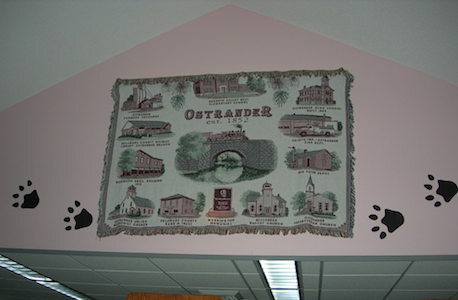 Mayor Jones presented The Ostrander Family Association a very nice blanket of Ostrander, OH, for which we thank you very much. We wish you many interesting look-ups in our “Big Book” and should you have any questions or ideas, please let us know. Attached is a photo of Scott and I exchanging presents and a close up of the blanket.